Early on in Never Alone, the little Iñupiaq girl Nuna is tasked with retrieving a drum from a mischievous group called the Little People. The task itself is not difficult. The Little People are holed up just a short distance away, and immediately give up the stolen instrument the second Nuna dodges their meager traps. But during the short journey, Nuna touches an owl. In doing so, a video explaining the role of Little People in Iñupiat folklore is unlocked. It explains that the Little People are not inherently mischievous—they are just regular people who share the frozen climes of northern Alaska, who also just happen to be small. This video, one of two dozen owl-delivered “cultural insights” that appear throughout the game, looks like the sort of minimalist documentaries middle school social studies teachers would wheel out of the closet during a weekday hangover. But in the context of Never Alone, this seconds-long clip is transformed—into a link between the game and an ancient folklore and to a people with an enduring legacy of storytelling. It took an action I had just performed and tied it to thousands of years of tradition of a culture I was wholly unfamiliar with. Never Alone does this repeatedly throughout its scant two hours of play time, making them two of the most powerful and beautiful hours this year. It could be said that this is the difference between having a game’s collectible gewgaws be meaningful versus having them be “stuff that was lying around.” (I’m looking at you, hundreds of pieces of slightly different concept art.) But cultural insights are just one aspect of a game that works at every point to tie the player’s actions to Iñupiat folklore, viewpoint, and experience. Based in part on Kunuuksaayuka, one of the many Iñupiat tales passed down by oral tradition until it was transcribed in the 1980s, the story focuses on Nuna, a young girl who has taken it upon herself to find the source of a blizzard that is ravaging her village. She is aided by Fox, an arctic fox who can call on the spirits of the natural world for assistance. On the journey they are challenged by threats both real and mythic: freezing water, polar bears, the Manslayer. The game takes great pains to explain the roles of these details, so it’s clear how they matter both in the game and to the Iñupiat. And it presents the story in lovely scrimshaw-styled animations, narrated in Iñupiat with English subtitles. Outside those scenes, the game uses an attractive stark cartoon style, but after a while, the only thing that draws the eye is Fox. Sleekly drawn and irresistibly animated, even Fox’s determined gait betrays how focused he is on protecting Nuna. This in turn made me want to repay his loyalty with my own. Curiously, I didn’t want to play as Fox—control can be swapped between the two characters at any time, and sometimes switching is mandatory to get Nuna past some frozen obstacle—but the animal is so well portrayed as a companion that becoming him felt like a loss of something crucial, having a fox pal. It doesn’t help that playing as Fox can feel overly fast and slippery. That’s a problem for a game solidly in the style of classic Mario. Never Alone’s focus on tying every element to the Iñupiat tradition trickles down to its jumping and puzzle solving. Very few elements in the game are malevolent, and natural phenomena can be a threat or a boon depending on how it is treated. The wind can knock Nuna down, but that same gust could also push her forward over a crevice and on to safety. There’s little violence, and the spirits that Fox calls assist by becoming platforms that carry Nuna, precariously, to new locations. It sometimes feels like this cultural connection came at the cost of some of the finer play details, however. Jumping feels imprecise, and sometimes it’s not clear where Nuna and Fox have to go until they’ve died a few times in the attempt. A two-player mode allows for Nuna and Fox to be played by separate people, and this is probably the best way to approach the game, as an AI-controlled Nuna is often suicidal—and if one dies, the other goes with, too wracked with grief to continue. These concerns would sink a game that was just telling a story into mediocrity. 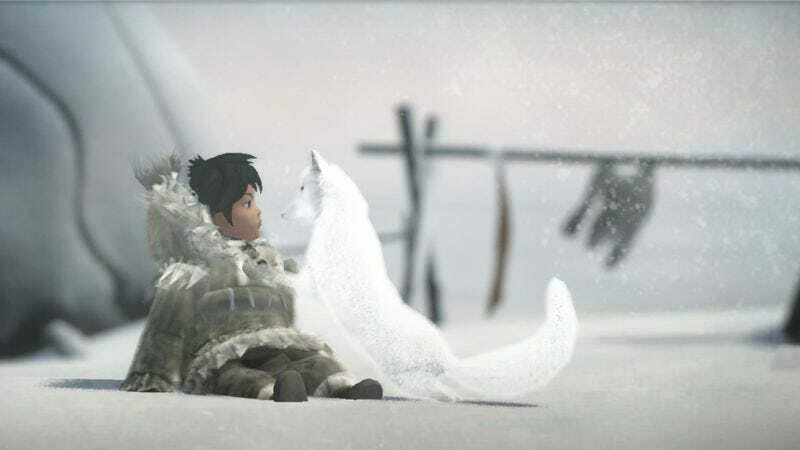 But Never Alone is not just telling a story—it is connecting the player to a culture. To play it is to be transported to two places simultaneously. First, to the world of Nuna and Fox, and their epic journey through the blistering cold. And second, to the warmth of a fire, listening to an old man tell a story that is as old as the Earth, feeling it sink into you for the first time.